Armando Anguiano Valadez was born in Guadalajara, Jalisco on October 12, 1920. His first academic art training started in 1935, at the Escuela Nocturna de Arte in Mexico City but he also studied at the prestigious Esmeralda School of Fine arts. Some of his teachers were Jesus Guerrero Galvan and Jose Chavez Morado. His work has been shown since 1946 in more than 200 solo-exhibitions and more than 300 collective ones internationally and is part of important collections around the world. In 1964 he was named Distinguished Son of the City of Guadalajara by the municipal government, a title he holds very dear to his heart. He is best known for religious themes in his artwork. On October 26, 2003, Armando Anguiano Valadez died of a heart attack at the age of 83, as he tried to break the record for the most paintings of the face of Jesus. 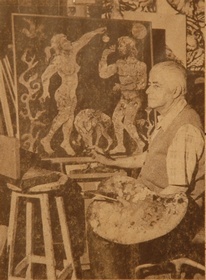 He left a legacy of more than 5,000 original works on this subject.